"Raymond Red is one of the pioneer figures of modern Filipino alternative cinema. Having a background in visual arts and photography after studying at the Philippine High School for the Arts and the University of the Phils. College of Fine Arts, he began by making numerous experimental and narrative super-8mm and 16mm short films in the 1980s and immediately gained recognition by winning awards and citations, both locally and at the international film festivals scene. 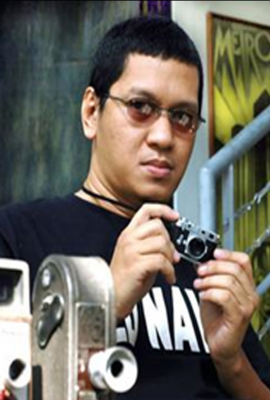 He had then begun to inspire a new generation of independent filmmakers, and has since become a regular lecturer and instructor in various film workshops and college film and fine arts, and mass communications programs, mentoring early on quite a number of the prominent Filipino independent filmmakers of today. In 1990 he was invited to the prestigious DAAD Berlin Artists in Residence program, where he was also awarded a film production grant by ZDF 2nd German Television. He then produced his first full-length feature film ""Bayani"" (Heroes), a low-budget historical bio-pic, it was one of the first truly Filipino ""alternative"" films released in commercial cinemas and thus considered by some as the indie film that bridged the gap between the Filipino alternative and mainstream cinema. He later made two other full length features, ""Sakay"" another historical epic which won major awards at the Manila Film Festival 1993, and ""Kamada"" a television feature that won awards from the Philippine Broadcasters Association and the Asian TV Awards in 1997. Red has earned the distinction of being one of the first Filipinos to receive a Rotterdam Hubert Bals Memorial grant, one of only two Filipino filmmakers mentioned in the Oxford History of World Cinema, and the first and so far only Filipino to have won the prestigious Palme d'Or award at the 2000 Cannes Film Festival for his short film ""Anino"". Red is also now distinguished for his technical expertise, and has served as speaker for new moving image technology launches of companies like Sony and Canon, Kodak and Fuji, and has also served as juror for both local and international film competitions. Red has also been active in television commercials and music video production, and has done a few more experimental short works. He has now done two recent award-winning full length features, entitled ""Himpapawid"" (Manila Skies) 2009, and ""Kamera Obskura"" (2012). He is in production this September 2015 for his new project ""Rebels With A Case"" due to come out November."